Google has launched a new interactive website that explains the incredible journey of an email message from the moment you click "Send" till it reaches the recipient. Google also explains the enormous security measures taken to avoid spams, clean viruses and provide security for your inbox... even using iris scans and fingerprint scanners!!! And if you are environment conscious, there is even more to rejoice for using Gmail. Google says it keeps its data centers up to the highest environmental standards. Google has made its data centers nearly 50% more efficient than any other typical data centers and also runs then using green power from wind farms. Google also claims it is the only internet company that has eliminated its effect on climate changes since 2007. So go ahead and check out the Story of Send website. But before that here is a cool video from Google explaining what's involved. How to Find Out The Location in a Photo. Preview PDF Files in Windows 7 Explorer Without Actually Opening them. 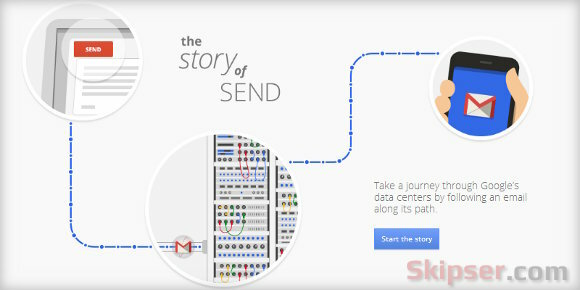 Google's new interactive website called "Story of Send" explains the incredible journey an email message takes from the moment you click "Send" till it reaches the recipient.